"Hydrophilic" sponges have tremendous water holding capacity. Known for their durability, they are super strong, resist solvents, and are very easy to clean. Packaged in convenient 100 pc. bales. Useful in all aspects, from tile to concrete, brick to boards, even washing trucks! 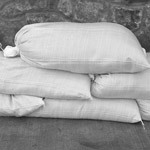 7 x 5 1/2 x 2 3/8"
These woven Polypropylene sandbags are also useful for transporting and storing bulk goods. Constructed to resist splits and leakage, the polypropylene bags are anti-skid and have ultra-violet protection up to 1600 hours. All poly bags feature a built in drawcord for fast closing. Black bags are reinforced poly with UV protection to last up to 4 years. This bag is ideal for use on construction sites where bags need to be in place for long periods of time. Not available with drawstring. Burlap bags are also available - call for your best price. Sand not included.